Paw has also posted about this concert. Twas a shivery day...we arrived at the Metropolis at about 6:15pm. Doors opened at 6:30. By the time we got there, there was already quite a line up. Even so, we managed to get pretty good spots...3rd/4th row back from the barrier. The only problem, as paw noted, was the two tall guys in front of us. I was able to see most times, but sometimes they'd just stand right in front. booooo. Ted Leo + the pharamacists was the opening band. I didn't really know much about them...maybe heard one or two songs from paw's awesome music mixes. I'd say they're good dancy/party music for the summer. She kindly sent me some songs...the one I enjoyed most was "Timorous Me" which has a kinda irish guitar sound going on about halfway. Most excellent. 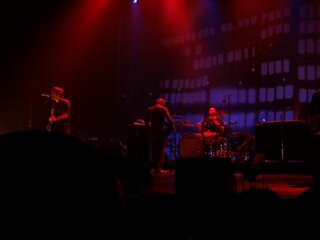 At about 9:10, Death Cab for Cutie took the stage. They were more rocking than I was expecting. 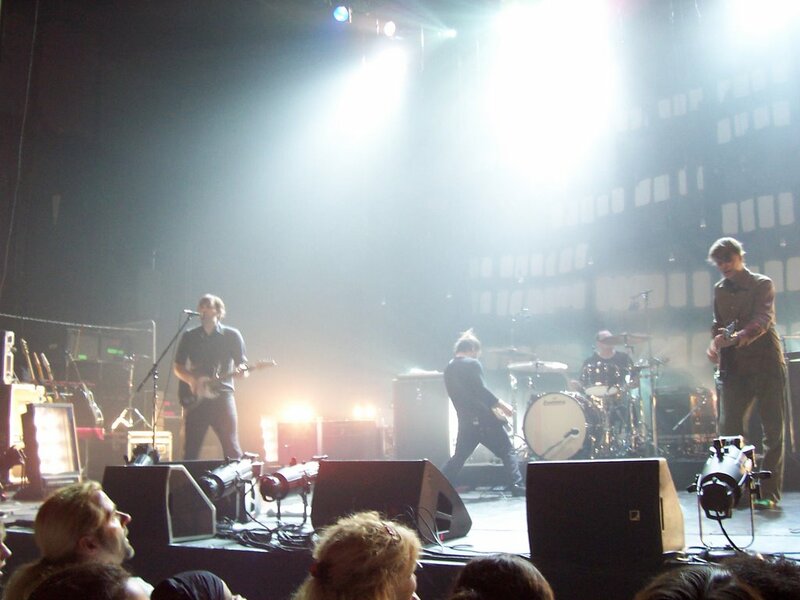 On their cd's they sound more or less mellow, with the exception of some bouncy/happy songs. But that's more like wheee, not rawr I can jump to this. I'm glad that they were so energetic live, because eventhough I enjoy the studio albums, I don't want just a repeat of it (like most people :D). 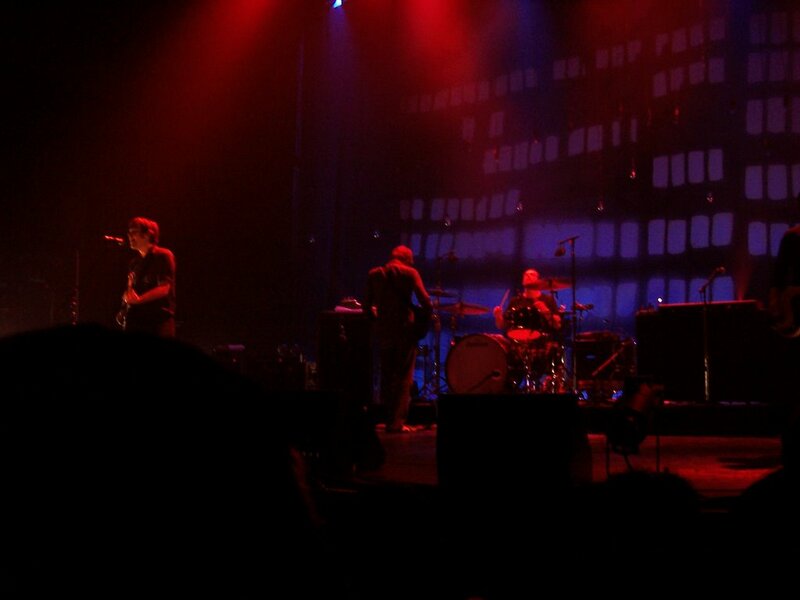 So yay for rocking death cab. 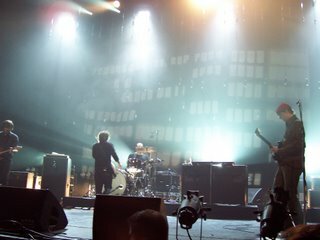 (There was one song in particular where there was like a 4 minute drum duo...Ben on a mini drum set and the drummer doing his thing, while other guitarist was on the piano. I think it was we looked like giants). (In red are the ones I especially wanted to hear. Trans gave me slight shivers. That's always a good thing). Below are some photos taken by Paw. This was at the end of "Transatlaticism". 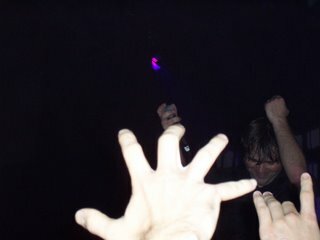 Ben Gibbard came toward the crowd and was singing "So come ooooooon". Everyone sang along. He really loved that. He also brought 3 people on stage to sing the "Come on" part, and they really got into it...especially one girl with red hair. Paw also took some videos. The sound is pretty good considering it was taken on a digital camera. The first one is "I will follow you into the dark" and the second is "Title and Registration". Just little clips of like 45 and 17 seconds respectively.